Astrology comes from the study of nature. Our human desire to see more, feel more, and be connected to more than just what the eyes can see provides the impetus to use what is visible to create deeper meaning. We see the sky, the Moon’s cycles, the Sun’s turning points, the seasons unfold and they tell us about hidden connections. They tell us about ourselves. Astrology uses every aspect of the natural world, not just the sky. The elements of fire, earth, air and water are also elemental to astrology’s wisdom. The elements are guides. They are allies. They are teachers. This month I want to cultivate a deeper relationship to the elements—a relationship I plan to nurture throughout the next year. At the Winter Solstice, the Sun enters cardinal earth sign, Capricorn. It joins with Pluto there and signals that this is a good time to look at our own personal infrastructures, our investments in our dreams, our plans for manifesting not only abundance but authority over our lives. Capricorn’s challenge to each of us is to take responsibility for living in integrity. Pluto says, dig through the fears and blocks; claim your power. Since Pluto entered Capricorn in the Fall of 2008, we’ve seen the ugly side of investment banking. Tired of hearing about greed, I want to claim the power of this planet’s ingress into Capricorn for the good that can come from Capricornian focus. I intend to invest in my dreams using the currency of the elements. What are the gifts of this element? What are the lessons that this element teaches? How do I cultivate relationship to the element? FIRE’S CURRENCY. Fire is life force. Without fire, nothing happens. Fire also provides the spark, of joy, aliveness, energy that not only feeds are intentions but also helps whatever we are creating to spread out into the world. The Sun, which rules fixed fire sign, Leo, is a good example of fire’s gifts and lessons. We need the Sun. We also need each of us to claim our right to shine and create. This fire lesson is about feeding the flame of our gifts and honoring our light through belief in ourselves. I honor fire when I allow myself to shine and when I notice the fire in others. Jealousy and envy are a manifestation of a scarcity mindset when it comes to relationship with fire. Delight and joy are the manifestation of fire-abundance. WATER’S CURRENCY. Water’s gift is replenishment. Like the tides that flow back into dry places, water can bring nourishment, a re-juicing of our dreams. Water’s tidal awareness also gives us the intuition to know when to pull back, flow away from the shore, and merge with source to feed the soul. Water teaches about flow and rhythm, but it also provides the emotional connection to the heart’s desire. We can think of all emotion, the grief and the love we experience, as the energy that nurtures our lives. Water welcomes it all. I honor water when I connect to the heart of compassion. I honor water when I rest and replenish myself. I honor water when I surrender to the flow. AIR’S CURRENCY. Relax the belly and become aware of how air moves into your body. How did that feel? Breathing practices teach us that air is the key to living an aware, relaxed, and balanced life. Air’s energy can be frenzied and overactive if we grasp too much with the mind. Yet this element is the ally of balance and ease if we cultivate mindfulness. With air’s help, we can achieve perspective—the ability to see the big picture, which helps us to not only understand where we are but also see where we want to go next. Balance helps us to respond in the moment in a way that feeds our dreams rather than subvert them. I honor air when I practice mindfulness, when I consider the exchange of energy in my life, and when I cultivate balance in all things. EARTH’S CURRENCY. The physical world is our greatest teacher, and earth our most precious resource. Earth’s currency is the wisdom gained from all actions. We learn about limitations, sustainability, and responsibility from this ally. In spite of all the ugliness that humans are responsible for creating, we still long to be in harmony with the beauty around us. Dreams are fueled by beauty. Harmony with beauty is living in right relationship to the earth. This relationship is not easy; it requires that we use earth’s currency: work, commitment, service, and sharing of resources. I honor earth when I set intention and back that intention with action. Personal practice is a way to support my intentions. Considering my impact is one way I can live in right relationship with earth. As deep winter settles around us here in the Northern Hemisphere, we can use this time to explore these elemental relationships. How will you invest in your own dreams? The following events of the month may illuminate relationship with the elements. 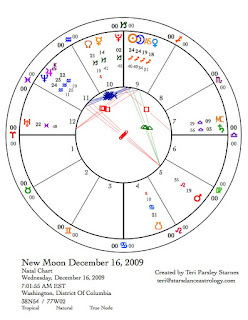 December 16 - New Moon is at 24° Sagittarius (mutable fire sign). 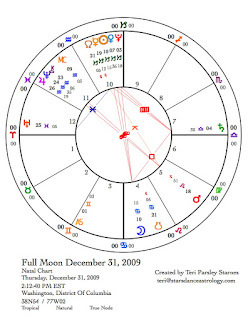 December 31 - Full Moon is a Lunar Eclipse at 10° Cancer (cardinal water sign). This winter full moon is a special time to connect to the World Heart. Next month, Jupiter will ingress into Pisces (mutable water sign). Water energy will increase significantly in 2010. Saturn in cardinal air sign Libra plays an important role this month, especially at the New and Full Moons. Please see last month’s blog to read more about Saturn in Libra. December 21 - Jupiter in Aquarius (fixed air sign) is conjunct Neptune. Read more about the triple conjunction of Jupiter, Chiron and Aquarius in past months. December 25 - Sun in Capricorn will square Saturn. January 13 - Saturn stations retrograde at 4° Libra. December 21 - The Winter Solstice marks the ingress of the Sun into Capricorn (cardinal earth sign). The Sun will be conjunct Pluto in Capricorn. December 25 - Venus enters Capricorn. 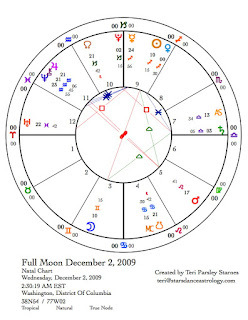 December 26 - Mercury stations retrograde in Capricorn and stations direct at the next New Moon on January 15. December 28 - Venus is conjunct Pluto. I’ll follow to my destiny. You always knew that you could. These words are from a familiar chant in the Pagan communities I belong to. We sing these words to evoke the sense of mystery and destiny that arises when we follow our dreams into the unknown. Astrological themes of the moment may remind us about the wonder and fear that can come from hearing the call and following it into destiny. We live in small circles and big circles simultaneously. In the small circle of our individual lives we may experience disappointment and disillusionment about dreams and destiny, which have no relation to the effect of these very same dreams on the large scale, that bigger circle of co-creation of our world and realities. A personal failure can still be a global success. How odd is that truth, and how painful. I belong to a community of dreamers who have been fortunate enough to have been led into wonders great and wild by two extraordinary dreamers—Cynthea Jones and Patricia Storm of Diana’s Grove. The Grove is undergoing profound transformation at this time. Recently, Patricia wrote: “Our (unrealistic) dream was to create a sanctuary where people could come to experience the world of nature free from the distractions of modern city life. We dreamed of a place to be in touch with the natural elements and to honor wind, fire, water, and earth. We also dreamed of a community of people striving to find ways to heal self, world, and relationships.” This dream led them to create a Mystery School founded on this land and this dream. After 16 years of tending the land and creating this dream, they are finding it harder to sustain it economically and have decided to sell the land. The Mystery School will continue but their intention is to pass the land onto others who will have the same magical connection to it. This might seem like failure on the small scale. Those demons of self-doubt rise up whenever we give ourselves wholly to a dream, but these women know a thing or two. And in spite of demons, they are still willing and ready to serve the dream. On the large-scale, on the level that is hard to fathom and can only be felt, Mystery continues to unfold; the ripples touch unseen shores. What wonder would never have existed in this world if they had not followed this dream? This story, this event, surely a small-scale event in the big realm of things, is an example of the energies that the celestial mirror is reflecting back to us right now. This energy begs us to ask these questions of ourselves: What dreams have I followed to my destiny? Am I currently lost along the way? Am I experiencing the pain of disappointment on the small-scale level of reality? Or am I excited for the journey ahead? Am I engaged with the call of the unknown and what is possible from daring to dream? The triple conjunction of Jupiter, Chiron and Neptune— a fairly rare occurrence (last time it happened was in 1945)—has been slowly, over the past few months, developing new dreams while exposing the raw vulnerability of passing dreams. During the lunar cycle that begins on November 16, these energies come to the forefront of collective experience. 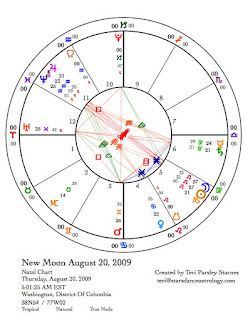 THE NEW MOON chart shows a square aspect between the Moon/Sun and the triple conjunction. The relationship between the two signs, Aquarius (Neptune, Chiron and Jupiter) and Scorpio (Sun, Moon) is one of tension. Aquarius has a heady, cerebral approach to dreams and Scorpio looks under the rocks for the real feelings and shadows attached to them. At the New Moon, we can set intention to integrate our heads with our hearts. On a deeper soul level, the realm that Scorpio loves, we need to acknowledge our feelings of grief surrounding the death of dreams and our desires to control the outcome. We simply can’t control the dream. We can only follow it to our destiny. Following to our destiny sometimes takes the courage as well as the foolishness of the hero. Mars is a good representation of the hero. This planet shows our passions, desires and ways we will pursue those desires. Every two years, Mars embarks upon the hero’s journey when it turns retrograde. Mars will be stationing retrograde on December 20 at 19° Leo. Right now, as Mars begins to slow down and station at that degree, this planet opposes the triple conjunction in Aquarius. This is an important stage where we are able to integrate into action the dreams these planets are weaving. A Mars transit is often a trigger for release of energy connected with astrological patterns. For instance, whatever our stage of dreaming —from the hope of new beginnings to the grief of failure, to recommitment—Mars can trigger a response, an event, a conflict, or new insight that makes us take action. This month we may find ourselves needing to take action on behalf of our dreams. And service to our dreams may ask us to take the next heroic step in our own journeys. This Mars journey lasts through the winter. In March, the month named for this planet, Mars turns direct at 0° Leo. Then, one by one, Mars will oppose these planets in the triple conjunction, which will have moved apart a bit. Neptune will be in Aquarius, Chiron in Pisces and Jupiter in Aries. The closest Mars comes to opposing all three of these planets simultaneously is around the time of the Full Moon on December 2. Leo is the Fixed Fire sign of the zodiac, the guardian of the flame. As Mars moves through Leo over the next seven months, we can be guided by the ally of fire. Fire teaches us about energy, life force, passion, joy, and transformation. Fire teaches us how to tend the flame that enlivens the dream. It would be good to devote time to listening to fire this winter and spring. PLUTO SQUARE SATURN. Both the New and Full Moon charts show this aspect. I wrote about the energy of this transit in last month’s blog. Both of these planets contribute to the feeling that stakes are high. And they are, aren’t they? Perhaps the burden that Saturn places upon us can to be lifted a bit by the playfulness of Mars in Leo. 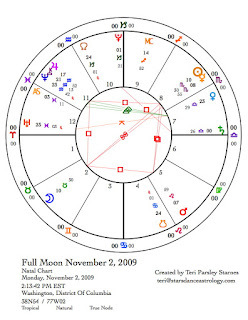 THE FULL MOON occurs when the Sun is in Sagittarius, another fire sign. During Sagittarius, we momentarily forget our burdens and take time to gather and celebrate. This energy of expansive hope can be a resource for future work. As you look at the shining face of the Moon, what will you invite into your life to feed your hopes? ANOTHER JOURNEY. At the Full Moon, Venus, the Morning Star, disappears into the light of the Sun. Ancient astrologers thought of the disappearance of Venus as the underworld journey of the goddess Inanna. Venus will reappear as the Evening Star by early March. Venus’ journey mirrors the one that Mars is taking. It looks to me like this winter we will be supported in going within and going deep to discover more about our own journeys. IMPORTANT DATES. The following transits are not a complete list of all transits for the month but are times when the planets emphasize some of the ongoing stories we are following in the Starsdance. World turning. This lunar month Saturn enters Libra, the cardinal air sign*. This is a big deal. Saturn is the Dweller on the Threshold, the definer and delimiter of our reality. This planet stays in a sign for 2 ½ years. During that time, we learn about reality through the lens of that sign. We also work on honing the gifts of that sign and meet the challenges offered by the shadows of the sign. In any sign Saturn gives us worthy work, but for the next couple of years Saturn’s position will be even more relevant because it will be in world-changing aspect to other planets in other cardinal signs. Those who follow astrology may have heard the term Cardinal Climax describing the transits of the next couple of years. Astrologers have noticed that planets transiting through the beginning of cardinal signs have a more potent impact upon the affairs of the world. We are entering a time when choices, past and present, come due for a reckoning of some sort. I take this as an exciting time, a time of possibility. It is certainly a time to pay attention. The hinge. The root of the word “cardinal” comes from the Latin caro or cardin meaning hinge. In this sense a cardinal sign represents a fundamental, crucial and important turning point upon which our future is hinged. As the veil between the worlds thins this month during the season of Samhain, it is a good idea to seek guidance and inspiration for the world-turning changes that are happening over the next few years. What are you called to do to co-create the world you envision? Whose help will you need? Diplomacy, alliances, and negotiations. The Pluto/Saturn cycle is approximately 40 years long. The current cycle between these two planets began in 1982 when they came together also in Libra. Now, almost one Saturn cycle later, they are in the waning square of this cycle, the last challenge before resolution of patterns set in place in the early 80s. Notably, the last significant transit between these two planets was the opposition during the time of 9/11. When these two planets are in aspect, neither wants to let go. Problems can feel harder under stressful aspects between Pluto and Saturn. However, both of these planets are incredible allies of manifestation. They represent desire for making a difference, having our lives mean something. Ingredients for the tone of the times to come are found in themes important to each planet. Pluto themes: power, transformation, secrecy, rebirth. Saturn themes: responsibility, realism, limitation, achievement. These themes are manifesting through Libra and Capricorn —hinges for how we must get along with each other and what we collectively believe will insure our survival. The cardinal fire sign, Aries, will not be part of the dialog until June 2010 when Jupiter and Uranus enter that sign. All our skills of diplomacy will be called upon when that happens. The New Moon in Libra is an excellent time to begin intention for Saturn’s transit into Libra on Oct 29. The Sun and Moon are trine to the triple conjunction of Neptune, Chiron and Jupiter. These three planets are allies of spiritual growth. They help to set a tone of higher aspiration for this month. Venus—the ruler of Libra—has just entered Libra. She is an ally of the best manifestation of the Libran qualities of beauty and balance. Venus is square to Pluto. Will we be fearless as we look into the shadows of our relationships or will become defensive? Our relationships can deepen through this connection. Uranus and Saturn continue to oppose one another from the signs of Pisces and Virgo. Again, these are the symbols of ongoing polarization we see around us in the world—a polarization that will feel even more important to resolve when Uranus enters Aries. Full Moon in Taurus and Sun in Scorpio. 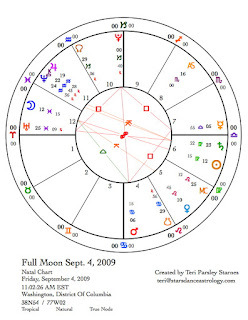 Aspects in the Full Moon chart tell an important story. It shows a Fixed sign Grand Cross. The Sun and Moon opposition is square to a Mars and Jupiter opposition. If cardinal signs are the hinges, the fixed signs are the anchors for the hinge. They hold down an elemental aspect of life. All the fixed signs, all the elements, show up at this time. The planets in this cross represent the four seasons celebrated at the cross-quarter holidays of Beltane, Lughnasad, Samhain and Imbolc. This configuration is a call to attention and reminds us to consider what we value about each of these seasons. What is precious about each? The fixed signs make sure we protect what we cherish. If we think of each piece of this puzzle as being in competition, there is stress between them. If we thick of each piece as precious and whole, they form an immutable anchor. I think we are being asked to see the bigger picture. 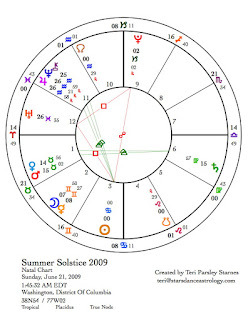 The first square between Pluto and Saturn is seen in this chart. They will square each other two more times in 2010. What will you protect? This is the lunar month for Samhain – the end of the growing season. This time of death is also a time when the veil between the worlds thins. We are closer to our ancestors and they to us. I also feel that I am closer to all Mysterious Ones at this time—spirit beings, allies, and teachers. This month we receive the gift of connection to Mystery, we are able to commune with the Wise Ones. It is time to ask about the path ahead and our roles in the evolving world. Mercury in Scorpio this month is the ally of communicating with Mystery. It is conjunct the Sun and part of the fixed grand square. All Mercury transits this month hold a possibility of important communication—receiving and giving. The most significant transits involving Mercury this month are squares between Mercury and the triple conjunction of Jupiter, Chiron and Neptune. These planets are broadcasting important themes about our current paradigm shifts. The lens of Aquarius emphasizes community, technology, and revolution. What are the Mysterious Ones telling you as the world turns upon the hinge of the season? *Saturn stays in Libra for 5 months and then retrogrades back into Virgo for 4 months. After that Saturn stays in Libra till October 2012. Dates important to our stories this month. These are not all the transits between planets this month but are important to the themes discussed in this article. I recently found this quote by one of my favorite astrological authors while researching for a class I am teaching. Prediction is one of astrology’s philosophical conundrums. Current astrological practice swings between the poles of thought that astrology is about prediction of events to the opposite idea that astrology is better used to describe inner states of being and the paths open to us for evolution of consciousness. However, the truth is probably somewhere in between. Inner states do influence events. Arroyo suggests that we can look at the planetary aspects and predict an experience. Perhaps it is our inner experiences that actually create the events around us. If that is so, knowing the outer influences upon our inner landscape is extremely important to creating better events. This is why I study astrology and why I write this blog. Fall begins during this lunar month. Astrologers study the seasonal charts cast for the moment of the Sun’s ingress into the new season to gain insight into the inner landscape of a nation. 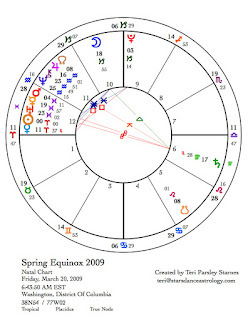 The Spring chart is the most important of these Ingress charts since it sets the pattern for the year. The subsequent seasonal charts show progression of that pattern. Health care is a huge issue right now for our country. The 6th house rules health. In the Spring chart, the Sun rules the 6th. So, we consider the condition of the Sun in that chart to look at 6th house issues for the year. Also important is that Saturn in Virgo, the sign of health, was located in that 6th house. 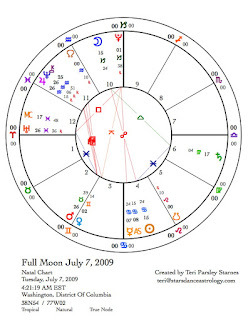 This Sun, located in the 12th house of hidden agendas and square to the planet of power, Pluto, shows us some of the problems we have had to confront in transforming health care. Saturn has its hands all over this issue too. It will not let us give up and also indicates that the struggle will not be easy. The inner experience of this is frustration, fear, paranoia and a sense of high stakes, yet there is also hope (the nature of the Sun) and commitment (the nature of Saturn). In the Summer Ingress chart, Mercury rules the 6th. In Gemini and conjunct the Moon in the 2nd house of values, the inner experience of the nation is colored by strong emotional reactivity (the Moon) combined with a need to express (Gemini/Mercury) values (2nd house). Saturn again is in the 6th house this season—still not giving up. 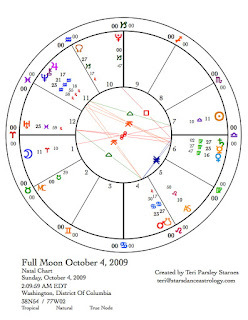 In the Fall Ingress chart, the Moon rules the 6th and the South Node in Cancer is located there, with Mars on the cusp also influencing these matters. The Moon shows the emotional level of the situation, which is quite strong. This Moon is in Scorpio in the 9th house of expansive truth and is square to the triple conjunction of Jupiter, Chiron, and Neptune—cultural change agents. Inner experiences will be dramatic and will most likely include dogmatism, power dynamics, reaction about loss of ideals or disappointment, and a strong tendency to be very reactive and defensive about the issue. With Scorpio emphasis, perhaps hidden agendas of power players will surface. The South Node tells us there are karmic patterns involved. We have the opportunity to re-pattern them. Saturn is no longer in this 6th house. I wonder if this will help us to make breakthroughs or if it signals giving up. The inner landscape of this lunar month. The quincunx aspect is a major theme this month. Aspects are relationships between the planets. Each aspect has its own energy. The quincunx is the aspect of adjustment to strange or contrary forces. This aspect occurs between two signs that have nothing in common. Under a quincunx, we may want to ignore the relationship between the planets but can’t. Like sand in the oyster, we have to deal with the annoyance. Currently, we need resolution, a way to integrate and balance. It would be lovely to have a clear way forward in solving our problems. We may even feel that we are on the verge of such resolution. But we are not quite there yet. So quincunxes can feel stressful. However, there is always an opportunity with every challenge. Quincunxes present the opportunity to really stretch and grow, so that when resolution does come, we’ve reached a new place, a new understanding. This lunar month, we are in that stretching place. In the New Moon chart, Sun, Moon, Saturn and Mercury are blending forces in Virgo. They are in quincunx aspect to the triple conjunction of Neptune, Chiron and Jupiter. The Virgo planets are also receiving a square from Pluto and an opposition from Uranus, so there is quite a lot of pressure on the goals and values of Virgo this month (see last month for more about Virgo). For the last few months, it seems that the Saturn in Virgo story has not been truly integrated into the Aquarian story. On one hand, Saturn has been asking us to perfect our practices, pay attention to health issues, refine our intentions. The planets in Aquarius have been slowly eroding old cultural forms without promising anything concrete to take its place. Neptune never promises anything concrete. It has been hard to create the forms that Virgo demands, while something really big, but very nebulous has been going on in the collective unconscious. If you’ve felt like you were going crazy over the past few months, I don’t blame you. It is hard to know how to move forward under these strange and contrary forces. Is everything going to hell, or are we on the verge of amazing new breakthroughs? What inner landscape do we need to cultivate in order to create the experience we desire? The quincunx transits this month may be turning points as we strive to answer that question. In addition to the quincunx aspect between planets in Virgo to planets in Aquarius, there is another set of quincunx aspects between Cancer and Aquarius. Together, these aspects form a Yod configuration in the Full Moon chart. This triangle of planets points, again, to the triple conjunction in Aquarius. The base is formed by an agreeable relationship between Saturn and Mercury in Virgo and Mars in Cancer. These Virgo/Cancer planets want us to be industrious, focused on tending others, creating order and security, yet strange Aquarian energy may create a disconnect. How disconnected do you feel? Celebrate the ways you reconnect with your sense of purpose this lunar month. Congratulate yourself on the practices you have developed while Saturn has been transiting through Virgo these past two years, which help you maintain health and equilibrium. It isn’t too late to begin new practices, or resolve to get back to old ones this month. Taking such action may help create an outer expression of harmony during a stressful time. Although Uranus in Pisces is not part of the quincunx aspects this month, transits involving Uranus will play into the very same themes of possible stress or anxiety since Uranus invites change. During this month of stretching, we can all endeavor to contribute to the outer expressions of peace and resolution. May these outer expressions, influence our inner realities. * This list is not a complete list of all transits for the month but the significant times during the month when it would be a good idea to survey the inner landscape. From Leo’s light to Virgo’s practice. This month’s lunar cycle navigates another cusp between signs (see last month’s blog about the cusp between Cancer and Leo). This time the cusp is between Leo and Virgo. The signs are products of the seasons; they are the story that Time tells us about place and pattern. Now in this season of late summer Leo describes the waning golden light reflected in the seed-laden grasses of the prairie and in the warm, glowing fruit of the vine. The gifts of the harvest mirror back to us Leo lessons about our own gifts and self-worth. My astrology teacher, Cynthea Jones of Diana’s Grove says, Leo is the sign that is jumping up and down screaming: “Pick me! Pick me! I need you to see me. I need you to need me.” This energy shifts in the Virgo season. Now, we get down to serious harvesting. This is the time to begin planning ahead: What will we need for the winter? How do we organize the food larder? Virgo time is an industrious time of canning, freezing, drying, and collecting. The New Moon occurs at the end of Leo. By the Full Moon, Virgo energy is in full force. Last month I wrote about the beginning of Leo and the King Arthur story. That story continues into the cusp between Leo and Virgo. Here in this transition the boy King has grown up and is now ready to move into the next phase of rulership—service to the kingdom. Through humility, service, practice, and discernment, Virgo refines Leo’s gifts. This month is a good time to reflect on how we wish to refine our own gifts to the world. Leo story. 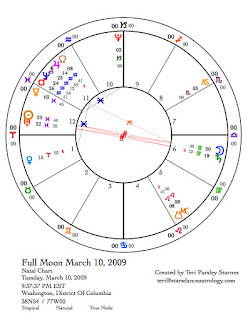 This lunar month, the Nodes of the Moon move out of the Aquarius/Leo polarity where they have been for the last 19 months and into the Capricorn/Cancer polarity. The nodes show us the growing edges and the karmic debts of the moment. The North Node of Aquarius has invited us to explore Aquarian ideals of community, technology, and visions. The South Node in Leo has offered us the opportunity to reprogram our beliefs and actions around self-worth, creativity, and leadership. The triple conjunction of Neptune, Jupiter and Chiron in Aquarius is also a part of this story. These three planets have created a tsunami of Aquarian energy. Neptune washes us in the possibilities of connection, technological advances, and grass root actions. Just yesterday in the New York Times, I read that the U.S. Army was allowing service members of any rank to collectively edit their operations manuals online through a wiki. This is Aquarian revolution. I wonder if in our collective thrill to embrace Aquarian ideals, we aren’t losing the individual—the realm of Leo. Certainly, there continues to be lots of ways we need to elevate the expression of Leo in our culture. Negative expressions of Leo may manifest as the way we glamorize others who are more beautiful or famous than we are, need a great deal of attention to feel good about ourselves, or believe that we must act alone to get anything done. The South Node can represent where we are blocking the more positive aspects of a sign through karmic events or patterns. Over the past 19 months, and especially in the months when there was an eclipse, we have had the opportunity to rethink what we believe about our self-worth. Capricorn story. Influences of Pluto in Capricorn gear up again as the North Node moves into Capricorn for a year and a half transit. Through the energy of Capricorn we reach for excellence, stability, and responsibility. Culturally, Capricorn represents hierarchy, ambition, and authority. As Pluto transits Capricorn for the next 14 years, Capricorn issues will be transformed on personal and cultural levels. Another influence in the Capricorn story happens when Pluto stations direct this month. (See date below.) In April, Pluto stationed retrograde, journeying deeper into the Underworld’s shadows and perhaps receding from consciousness a bit. Now, Pluto begins to return to the surface. The volcano is an apt Plutonic image. 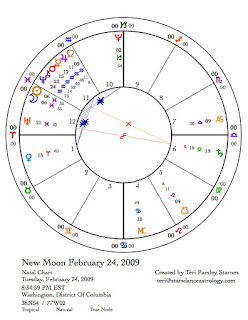 When Pluto reaches the degree of the zodiac where it turned retrograde, which will happen on December 31, 2009, we can expect new lava to flow over dysfunctional Capricorn systems. Stations are powerful times. Pluto will still be stationary on the Fall Equinox when the Sun will exactly square this powerful Pluto. The fall is sure to be a more dynamic time with this planet influencing the energy. I will write more about the fall season in next month’s edition. Virgo story. Two planets are found in Virgo in the New Moon chart: Saturn and Mercury, Virgo’s ruler. Both of these planets point to the potential and to the stress of this New Moon chart. Mercury aids Virgo’s mission—to improve through practice, to serve humbly, to create perfection through discernment—yet Mercury can be unpredictable and jittery. Saturn contributes an unrelenting focus on Virgo desires and we may succumb to extreme self-criticism through this force. There is so much potential in this New Moon yet we’ll have to practice self-love to reach that potential. Uranus is opposite this pair of planets, promising breakthroughs but also creating stress. The ongoing influence of Saturn opposite Uranus returns for the third time month. [See past editions on this transit that began November 2008.] This planetary configuration will influence the health care reform debate and outcome. Forces of change (Uranus) are in opposition to forces of conservation (Saturn). Yet this Saturn is in the sign of health –Virgo. I am reminded that even though it seems that the opposing forces want radically different things, they actually both want to improve health care. Perhaps this realization will allow us to move forward in what seems like a stalemate. I keep thinking that the opposition between Saturn and Uranus is telling me to choose the third path and reject old polarities. Since Mars will also be squaring (challenging aspect) Mercury, Saturn, and Uranus, as well, we might expect that any smoldering tensions may blow up this month. It is important to look out for any of these stressors in our own lives and make conscious choices about how we want to use our will and passion. 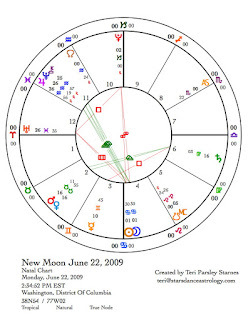 The New Moon is dramatic not only because of these Virgo influences but also because the Sun and Moon are located opposite the triple conjunction of Neptune, Jupiter and Chiron. This opposition is in turn part of an aspect pattern called a Boomerang Yod (increasing stress, crisis in understanding, sense of destiny). At the bottom of the Yod triangle, Mercury and Saturn are in sextile aspect to Venus in Cancer. These planets are in quincunx aspect to the planets in the triple conjunction. The quincunx aspect is about striving to understand or account for paradox. There is again great potential this month to understand what these three planets in Aquarius are telling us and how we are changing our culture in response. If the first two weeks of this lunar cycle seem stressing yet illuminating, the Full Moon invites in the unexpected resolution offered by the Trickster. Mercury is stationary in the Full Moon chart and turns retrograde two days later while being square to Mars. Stationary Pluto is also part of this story. In the worst cases, Pluto influences us to need control over the unexpected; Mars can influence rash choices; and Mercury invites the unexpected. The opposition of the Sun in Virgo and the Moon in Pisces may offer peace and calm. Pisces reminds us to see the whole pattern and merge with it; Virgo reminds us that small, practical steps can make a big difference. A Virgo spell. On August 22, Saturn reaches the degree where it turned retrograde in December of 2008. This means that from August to January 2010, when Saturn stations retrograde again, this planet will be covering new ground. Each of us has new Saturn lessons in store. For this month, these lessons are all about working with change and creating perfection—big issues. I am planning to work with a honey spell for this month to help me with these energies in my life. Bees are wonderful Virgo allies—they work tirelessly. Their systems of creating the hive, caring for their young, making and storing honey are very Virgoan. In fact the bliss and sweetness of honey is a great reminder that Virgo’s work can create rich blessings. I thank Donald Engstrom for creating and introducing me to honey spells. How I work with honey. First I create an intention. It is helpful if the intention can be said as a short poem or song or statement that is easy and delightful to repeat. Then I select my honey. I like to work with small jars of single source honey, for instance Marsh Flowers honey, or honey that is produced locally by people I respect, or honey from special places dear to my heart. Next, I charge the honey with my intention, by holding the honey and singing to it, placing it on my altar where it can capture sunlight or candlelight, and I also like to draw symbols on the jar that represent my intention. Then I taste the honey, saying my prayer, letting the sweetness creep and flow onto my tongue and throughout my body. I taste this honey whenever I need it. I remember to thank and bless the bees. If you decide to work with a honey spell this month, I’d love to hear about it. Dates important to our stories. 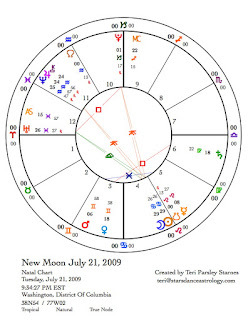 New Moon of July 22 is also a total Solar Eclipse occurring on the cusp between Cancer and Leo. Each sign has 30 degrees, somewhere around the end of a sign and beginning of the next sign is the borderland where two signs mix. Not quite all Cancer, and definitely not all Leo, this eclipse (at 29° Cancer) takes place in the liminal place we could describe as between the worlds. Every eclipse has the potential to plunge us into unfamiliar territory. I’ve often described eclipses as a rebooting of a computer—new files, new format. The change can be sudden. Eclipses tend to affect people most when the degree of the eclipse is near an important degree in the natal chart. But for all of us, this eclipse is a chance to explore the land between Cancer and Leo. I once had a reading from Pat Kaluza, a wonderful astrologer here in Minneapolis, who described the cusp between Cancer and Leo as Cinderella longing to go to the ball. The reason: Cancer holds the energy of hearth-tender in service to the family; Leo holds the energy of glamour, excitement, and drama. Who wouldn’t want to go to the ball when confronted with this choice? In this dilemma rests a cultural assumption: It is better to be in the midst of excitement than to be home tending the needs of others. Is this true? Do you feel this choice in your own life? What do you consciously choose to honor? At the cusp there is a blending of the wisdom of the previous sign with the innocence of the next. The wise mother, becoming Crone, embodies one expression of Cancer’s ultimate gifts. At some point each of us will reach the stage of wise mothering, when what we have nourished and cherished dearly must be released into the world. Leo’s innocence is expressed by the archetype of the young king. I often think of King Arthur’s story here. When he went to the tournament as a page, Arthur had no idea of the destiny awaiting him. Early degrees of Leo remind us that each of us has a royal destiny, a gift we are meant to share with the world, a gift that may be only now emerging. Do these stories resonate for you at this New Moon? Cusps invite alchemy. How do we blend the wisdom of the mother with the innocence and potential of the young king? Do you feel this paradox? Can you imagine choosing both rather than one or the other? What would this look like in your life? Venus square Saturn. There are other story lines occurring this month. At the New Moon, Venus in Gemini is square (challenging) to Saturn in Virgo. Sooner or later every relationship runs into the topic of differing communication styles. This New Moon is a perfect setup for experiencing these differences in our relationships. Saturn insists on seriousness; Venus in Gemini wants highly diverse conversation, but not necessarily very deep. It is really all about connection even when we don’t understand how the other is trying to connect. The relationship between Gemini and Virgo is interesting. Mercury rules them both, but with quite different results. Gemini is yang energy – expansive and eclectic. Virgo is yin energy, focused and pragmatic. This is a good month to explore relationship commitments and communication styles. What works for you? What works for your partners and friends? Trancemission/transmission. I continue to ponder the meaning of the triple conjunction of Neptune, Jupiter and Chiron. I began writing about this transit in April. These three will be traveling close together until January 2010. Chiron will makes an exact conjunction with Neptune in February, 2010, so it may not be until after then that we have a big picture of this transit. Neptune works below the surface in the subconscious. Neptune entrances. Under the surface, in trance, in dream, we are moving to another paradigm. The clues to how we are changing come from the sign—Aquarius. What does the dawning of the age of Aquarius mean to you? We are in the flow of that becoming. This month transits to these three planets by Venus, Mercury, Mars, and the Sun (see below for dates) will illuminate the trance mission of the Neptune, Jupiter, and Chiron conjunction. Full Moon August 5, 2009. Every sign has a shadow reflected back by the opposite sign. For Aquarius it is Leo. The Full Moon this month is a Lunar Eclipse in the signs of Aquarius/Leo. This Full Moon at 13° Leo/Aquarius the young king evoked by the New Moon is almost halfway through his story. Now is a good time to reflect on the relationship between Self and Community, between kings and subjects. Neptune pulls us into the communal dream of Aquarius. Leo reflects back another perspective on any illusions that we hold about community. Although every community is made from individuals, group mind can work to outlaw the expression of individuality. On the other hand, if individuals never compromise community vision suffers. Do you notice this dynamic in your communities? Do you feel yourself on the extremes of this polarity? How do you balance between them? Mars square Saturn. Just as Venus squared Saturn at the New Moon, the Full Moon chart shows Mars squaring Saturn. Saturn in Virgo has been a little quiet in recent lunar charts. All the action has been with Pluto or the triple conjunction. This lunar month, we may feel more of Saturn’s burden. This planet reminds us that we have important work to do, and that to get to where we are going, we will need to take each step consciously and deliberately. The Mars connection emphasizes this quality. Mars, our energy, will and passions, wants to move fast. Saturn slows everything down. Especially in Virgo, Saturn insists that we dot all our “I’s” and cross all our “T’s.” This can feel frustrating but potentially rewarding. Stories, like dreams, can guide us. There are nuggets in every story waiting to illuminate our paths. Finding the right story for the right moment is one of astrology’s gifts. May you find your true story this month. The Sun and Moon meet in Gemini this month. The signatures of this mutable air sign are all around me, from the pollen drifting in the wind to the enlightening coincidences brought to me courtesy of the divine trickster, Mercury. Our minds speed up in the season of Gemini, or seem to. My mind is buzzing as I consider where we are in the evolutionary journey. This month, I’d like to share the ideas floating in the air around me. Perhaps they will fertilize something emerging in you. The “Universal” is where it’s at right now. All the universal planets, Uranus, Neptune and Pluto, are in the universal signs, Capricorn through Pisces. Hedge witch philosopher, Donald Engstrom, likes to remind people that we live in a larger reality than a single universe. He points out that actually, we dwell in the multiverse. It It takes an expansion of the mind to grasp this idea of simultaneous multiple universes. The outer planets in these larger, multiversal signs are poised to help us expand mind, consciousness, and possibility. Astrology’s lifeblood is coincidence. Coincidence or synchronicity can lead to enlightenment. If there is one thing that astrology has taught me and that I try to pass on to my students and clients, it is that there is meaning all around us. Random events and patterns found in the sky tell us that the cosmos is alive and is communicating with us. And we can communicate back! Lately in my world, I’ve noticed conversations about the Trickster, fears about global pandemic, the importance of community, and teachings about duality. The cosmos is communicating about these important topics via these important events: the triple conjunction of Neptune, Chiron and Jupiter in Aquarius (for more about this transit), Mercury’s retrograde journey beginning in the sign of duality—Gemini, Pluto’s ingress into Capricorn. (for more about this transit), and the ongoing opposition between Uranus and Saturn. (for more about this transit.) There is a lot going on. Actually, all the planets and signs are constantly telling us something. The challenge and the fun is teasing out what is important now. The New Moon in Gemini sets the tone of the month. The ruler of Gemini is Mercury and Mercury is currently retrograde. Mercury retrogrades three times a year, the most of any planet. Having to do with communication, travel, and thought, Mercury shows us how to reweave duality into unity and then back into duality. The most mobile of planets and gods, Mercury never stays fixed for long, just like our own minds. Last weekend I had the delight of attending a Yoga Nidra class taught by Katherine Banbury at her Kula Center for Yoga in St. Paul. According to Katherine, Yoga Nidra is a meditative practice that helps us to perceive duality and the transcendence of duality. “Yoga Nidra points out that we live in two worlds simultaneously, the world of Immanence wherein we experience everything, and the world of Transcendence where we are aware of everything. Transcendence is the other half of the equation whereby we realize that we are the Presence in which life is immanently unfolding.” – from Banbury’s class handout. During this guided meditation we are led into the experience of duality, then the merging of duality while we ask the question, ”If I am not this, nor this, what am I?” Perhaps because Mercury was retrograde during the class, I found that I could step into that third, strange place where everything was indeed possible. Mercury likes to present possibilities while keeping actualities just out of grasp. This is his Trickster aspect. What new possibilities are luring you into the next stage of your journey? 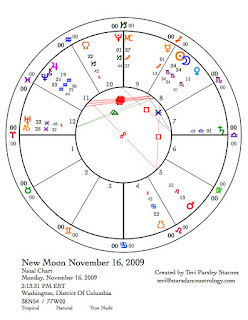 Last month’s new moon chart showed Mercury at 24° Taurus square to the triple conjunction of Neptune, Chiron and Jupiter. Due to retrograde motion, Mercury is back again for another statement squaring these three planets from 24° Taurus. Two days after last month’s new moon, the United States declared a public health emergency based on the outbreak of swine flu in Mexico. Although the triple conjunction of Neptune, Chiron and Jupiter is about so much more than world pandemic, this signature fits well with the global health crisis that may be before us. Mercury is the messenger, the broadcaster, of the solar system. Perhaps this month, new broadcasts about our common concerns will come to the forefront. The questions I am holding are: What are we learning about our connections? What separations are no longer relevant? How do we broaden our awareness to include diverse cultural points of view? How do we take care of each other? I came across this message while doing some research on the web: “Over the last 14 billion years, as western science currently understands it, the growing edge of evolution – the appearance of radically new forms of complexity – has moved from the cosmic to geologic to biologic to cultural.” - Peggy Holman, co-author of The Change Handbook. If this is true, then the stars are affirming that our growing edge is in cultural evolution. Mars and Venus sextile the triple conjunction. This encouraging relationship between both Mars and Venus to Neptune, Chiron, and Jupiter this month present opportunities to embrace cultural evolution in an exhilarating manner. Another interesting feature of this New Moon chart is Saturn standing unaspected and lonely at 14° Virgo. Unaspected planets sometimes scream out for attention. Saturn has recently stationed direct after a retrograde journey that began on December 31, 2008. Saturn will be regaining ground until August when it will move rapidly through the last degrees of Virgo, entering Libra on October 29. The ingress into Libra will invoke the square aspect between Pluto and Saturn. This is a highly significant transit signaling more work and hard lessons. But for now, it is important to notice how Saturn in Virgo is teaching us what we need to know. I think of this as my opportunity to acquire Virgoan skills that surely will come in handy in the coming years. These skills include: right-relationship with perfectionism, discernment, personal practice related to spirituality and health, and a sense of what I am serving and why. The Full Moon is an important turning point in the lunar cycle. 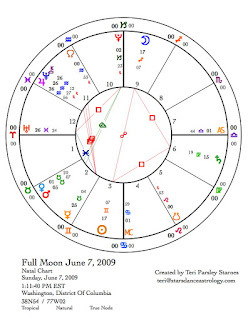 In the Full Moon chart for June 7, Mercury is again playing a major role. Mercury is at 25° Taurus, this time moving direct, and still squaring the triple conjunction. To add an extra punch these planets are stationary, meaning they are near the degree of changing direction. Stationary planets are more powerful and anyone who has personal planets or important points in their charts ranging from 20° to 28° of any fixed signs (Taurus, Leo, Scorpio or Aquarius), will certainly be feeling the effects of these stations. We will all feel this energy, but for you it will be personal. At the full moon, Saturn is square to the Sun and Moon. With the emphasis this month being on the mind, Saturn in earthy Virgo reminds us to get practical. Where do your hopes and dreams meet reality? Although Saturn seems to but a damper on our optimism, what Saturn really does is make our dreams real. What is that work like for you? The lunar month ends with the Sun entering Cancer, otherwise known as the Summer Solstice. Next month, I’ll write more about what that chart is showing us. June 6 Venus enters Taurus after being in Aries (mostly) since February. Venus rules Taurus. She is happy there. June 21 Venus 15° Taurus conjunct Mars. Desire is strong, express it sensually. Communities are playing a huge role in our world. It seems that every single page of the newspaper these days one finds something written about new online social networks like Facebook and Twitter. Cutting edge culture is about networking, communal action, global consciousness. It seems like we are now really at the dawning of the Age of Aquarius, the sign where all this energy fits. Three planets and the North Node of the Moon currently occupy Aquarius. Jupiter, riding the wave of all this collective expression, entered Aquarius in January 2009. Neptune has held court here since 1998. Chiron has been in Aquarius since 2005. All three of these planets are rendezvousing at 26 degrees Aquarius in May. Perhaps this near exact triple conjunction is the crest of the Aquarian wave that has been building since Neptune’s ingress into the sign. Astrologers are at odds about when the true dawning of the Age of Aquarius will be—it may be now, it may be in 200 years or so—but this month will be a good peek at what the new age has in store for our world. What is the power of community? During this year while Jupiter is in Aquarius, we are inclined to believe that the power of community is the greatest power we have. That’s how Jupiter operates. There are two teachers in the zodiac. Jupiter is the cool professor whose classes are always full; the lessons are fun and seem to reveal something very important even as they disappear quickly from our memories. Saturn’s classes, in comparison, are unpopular, there is a lot of work, but we always remember what we learned in that class. Yes, Jupiter moves on more quickly, but with the added oomph of Neptune and Chiron, there is opportunity for a true shift in consciousness. We have the opportunity to focus less on our individuality and more on our collectivity. According to these scientists, this may be key to our survival. The other teacher, Saturn continues to tread the ground of Virgo. Saturn stations direct this month, increasing the Saturn effect. In some ways, the two signs—Virgo and Aquarius—could not be more different from each other. Virgo is methodical, resists grand leaps of faith. It is hopeful only if all the practical groundwork has been laid down first. Otherwise, there is too much work for Virgo to be truly optimistic. If Aquarius describes communal life, then Virgo is the Hermit, the solitary energy of steadfastness. Whenever paradoxical energy is present, we can learn to navigate the middle path. What energy are you feeling more strongly? How can you benefit from broadening into the other point of view? The communal exuberance we may be experiencing right now can be grounded in the practicalities of Virgo. 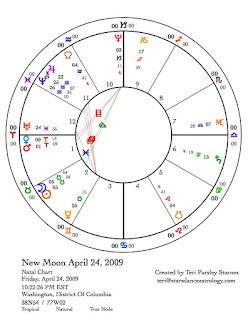 The New Moon of April 24 has the Sun and Moon at 5° Taurus square to the nodes of the Moon. (North node at 4° Aquarius and South node at 4° Leo). This position of the New Moon is called “the bendings” of the nodal axis—a potent location in the zodiac. Emphasis is placed at this time on the nodes, what they are calling on us to learn (North node) and renew (South node). The agenda may be to learn how to be communal people once again. The renewal should occur in the arena of ineffective attitudes about individualism and ego. It isn’t that the Leo nature is bad, because it isn’t. Leo is necessary to our communal possibilities. But we need to reevaluate what has not worked about this energy in the past. The other fixed signs, Taurus and Scorpio get the spotlight this month. Taurus at the New Moon; Scorpio at the Full. These signs add the significance of life and death to the equation. What is abstract and theoretical in Aquarius and pure potential in Leo, needs to get real in Taurus and Scorpio. People with earth and water emphasis in their charts may feel relieved that the energy returns this month to this domain. When all fixed signs are activated like they will be this month, struggles can be intense. However, these struggles can also fuel our creativity and resolve. Mercury’s role this month. 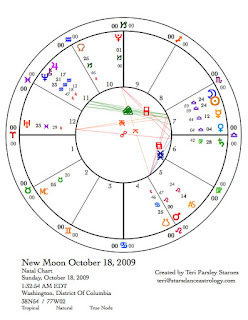 In the New Moon chart Mercury in Taurus is square to Jupiter/Chiron/Neptune. Then it stations retrograde a few days later on May 6. Mercury is not only the Trickster. Mercury is also the lens that focuses our perceptions. If the energy of Jupiter/Chiron/Neptune has been somewhat nebulous so far, then this month through the trickster’s lessons, we may be able to define what this transit is about. Or maybe not. I never take Mercury retrograde periods for granted. If we are coming to rely heavily on our computers to link us to community, then Mercury is poised to wreak havoc on those systems. How else might we create community? Are we too dependent on computers and cell phones? My recommendation is to back up files. And to notice. Mercury retrograde periods are fantastic for noticing our assumptions and how they can get us into trouble. 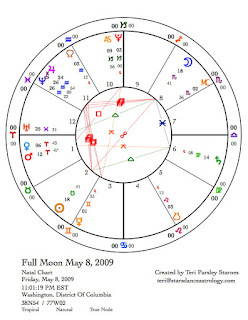 The Full Moon chart shows Mercury retrograde at the degree of stationing. The Moon and Sun are squaring the triple conjunction of Jupiter/Chiron/Neptune. Both Mars and Venus are in Aries. Saturn is also stationary. As a complete picture, the energy is elevated. Impulsivity is increased with the squares and with Mars and Venus both in Aries. The stationing Saturn points to pent up energy, perhaps expecting more perfection from self and others. Mercury presents us with uncertainty. Perhaps the best use of this Full Moon period is to simplify daily life, at least for a few days. The caution is to not be so busy, and so dependent on computers and fast communication, that we aren’t able to tune into the spiritual significance of the planets in Aquarius. We have always been communal creatures. However, the challenges of our world may be asking us to make better use of community so that we can make the changes we need to for the survival of our beloved planet and our beloved friends and families. Chiron shows us the opening in spirit where we can embrace this new way of being. May it lead to healing. As I sit down to write about this lunar month I wonder, “What do I need to be mindful of for the next few weeks? How can I best adapt myself to this energy so that I may embrace life in the most authentic, joyful, and effective way possible?” These questions are my guides for using astrology. I find that I use my awareness of the earth and the seasons to inform me about energy as much as I use astrological symbols. How can I ignore the influence of spring thaw here in Minneapolis, the returning light after a dark winter, the swollen rivers spilling their banks? These are as important to me as Saturn transiting Virgo and Venus retrograding through Aries. As an astrologer I constantly ask myself, what must I pay attention to? What serves me, the clients who come to me, and what also serves the whole, my contribution to co-creating the world as I attempt to live mindfully each day? The answer to this question shifts and changes often. It keeps things interesting. Now, at this New Moon in Aries, I find myself paying attention to several celestial strands of energy. I am aware that Pluto is preparing to station retrograde shortly after the New Moon; that Neptune, Chiron, and Jupiter are coming closer and closer together culminating in a near triple conjunction at the end of May; that Venus is continuing her retrograde journey in Aries; and that during the season of Aries I want to pay attention to its ruler, Mars. As I notice energy and events, I find that it is helpful to keep several stories in mind at one time. Never do these influences occur in a vacuum, sequentially, or neat and tidy with beginning, middle, and end. Rather, they seem to ebb and flow, sparked into action by subtle shifts like the Moon making an aspect. Sometimes the strands become so complex, I take a break from all the information, return to awareness of my body, the earth, my beloveds. Sometimes it seems to me that paying attention itself is the point, and it is not so important that I know or understand all these influences. As the rivers in my area of country crest and exceed their boundaries, I offer the idea that we can also accept the unknowable, let it move us beyond our own boundaries. We are all this and more. 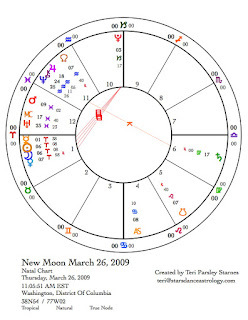 The New Moon in Aries on March 26 finds all planets except Saturn within the space of a square between Pluto and Venus, implying a tight focus, a concentration of energy. Pluto is stationary at this time. A planet’s influence is stronger when it stations (seems to stand still right before changing apparent direction, either retrograde or direct). Pluto has been stationing retrograde every March since 1994. Next year, it will station retrograde in early April. For more than a decade, Pluto has been asserting itself into the transitions of spring. This seems appropriate considering Pluto’s (or Hades’) role in the springtime story of Persephone’s return. When Pluto retrogrades, the earth itself responds. We also respond. The name Pluto means “the giver of wealth which comes out of the earth beneath.” Pluto holds wealth in the shadows, in the things we refuse to or are unable to acknowledge, and then, when it is time, he releases the wealth and we claim the hidden, forbidden treasures. Pluto gives life back to us. Since September 2008 when Pluto last turned direct, this planet has been slowly forcing us to confront the shadows hidden away in Capricorn. Now, he stations and recedes, leaving behind compost for our fields. How will you use this wealth as you plant the seeds of your heart’s desire? Remember, Pluto’s energy feeds life itself. What needs rejuvenation in your life? If you have planets or important points in your chart ranging from 0° to 5 ° of a Cardinal sign (Aries, Cancer, Libra or Capricorn), you will feel this station strongly. Pluto is moving through your life. Last month I wrote about the Venus retrograde journey. She is halfway through that process. The day after the New Moon, Venus in Aries is conjunct the Sun in the heart of the retrograde journey. In this place, joined by the Moon and Mercury, Venus meets a challenging aspect from Pluto. Aries is perceived as being courageous, but the truth of the matter is that Aries is more foolish than brave. An Aries individual “does it afraid.” In other words, they often do not feel courageous as they take a stand or move to the head of the line. They simply recognize the need to act. Have you felt the urge to act even if you haven’t felt courageous? Perhaps this challenge will intensify during the period of Venus square Pluto. Perhaps because you have answered the call of this challenge, you will reap Pluto’s rejuvenation. There are hard edges to Venus in Aries square Pluto. This aspect may not be easy on relationships. With all this impulsive Aries energy around, it is a good idea to look at Mars this month. Mars rules Aries. He is the actor who best carries out the Aries need to emerge and to do. Mars starts off the lunar month, gentle and intuitive in the sign of Pisces. But he doesn’t stay that way. In the New Moon chart, Mars is unaspected, drifting alone in a fairly unmoored sign – Pisces. It may seem to us that spring is getting a slow start. The best way to use this lull in energy is to recharge the batteries, spend more time in reverie, tune into the heart’s messages. On April 4, when Mars opposes Saturn, we will receive the message that we now need to be serious and get down to business. Saturn will want to pull Mars back into a more realistic orbit. When Mars comes into conjunction with Uranus on April 15, the fireworks will likely start. These two planets provoke action and reaction. Even in the calm sign of Pisces, we will want to do something that feels more authentic, that brings change. 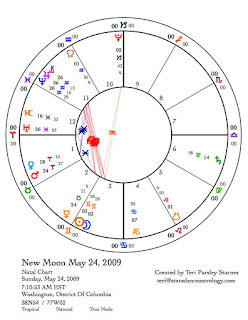 Right before Mars enters Aries on April 22, he comes into conjunction with Venus at 29° Pisces. There is something poetic about this conjunction between the ruler of Libra (Venus) and the ruler of Aries (Mars) taking place right after Venus turns direct. Perhaps there is a final lesson for Venus – a way to honor the Aries struggle of individuation, which is often in conflict with the Libran need to be in relationship. When we honor both needs, what is created? What is possible? Mars enters its own sign on April 22 where the impulse pursue what we want is strong. Mars stays in that sign until June 1. If it hadn’t really happened before, after April 22, spring will be in full force. Along with these strands, there is another story developing that will color our experiences for the next few months. At the Full Moon on April 9, Jupiter, Chiron and Neptune are forming a tight cluster called a stellium. I wrote about these three planets in last month’s New Moon forecast. I have noticed that most of my clients recently have planets or important points in their charts which will be impacted by this transit. Why are these people showing up now? This coincidence affirms that it is a good idea to pay attention to these energies. Jupiter, Chiron and Neptune will be important teachers over the next few months. I associate Obama’s presidency with the optimism of Jupiter in Aquarius. He stands for our communal dreams of a better future. His nodal axis (his karma and destiny) falls within the degrees of this transit (North node at 27°Leo). I think he will hold an important piece of what this transit means to us at this time. If you have any planets or important points in your chart between 24° to 27° of the fixed signs (Aquarius, Taurus, Leo, and Scorpio) this transit will strongly impact you. 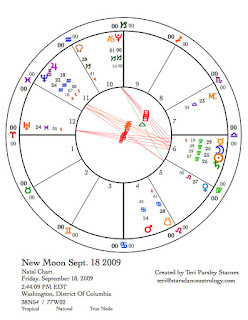 The Pisces New Moon is a time to surrender form. It is a time to dive deep one last time into the dreamtime of Winter. It is a time to gather inspiration from the unseen worlds. Pisces is the end of the astrological cycle that begins with Aries. When the Sun enters Aries this month on March 20, the Self crystallizes again into form. The goal is to emerge and begin the task of discovering who we are. Pisces asks: What do I make sacred as I surrender this form? Aries asks: Who am I? Who do I want to be? These two enquiries are important this month. Although the Sun, Moon and Uranus are in Pisces in the New Moon chart, there is still a significant collection of energy in Aquarius at the beginning of the lunation cycle. The North Node (growing edge), Jupiter (expansive belief), Mercury (acquiring and processing information), Mars, (action and will), Chiron (the shaman), and Neptune (transcendence) are strung across the sign of the Water Carrier. Last month I wrote about the Aquarian energy of the Inauguration. Throughout this year Aquarian ideals—freedom, possibility, and revolution; hope in technology; an increase in social networking via the Internet; refining what it means to be human; attending to community needs and the need for community—will remain strong as Jupiter, Chiron and Neptune come closer together this Spring. The other ongoing subtext to this year, Uranus in Pisces opposite Saturn in Virgo, is emphasized in the New and Full Moon charts this month. [I’ve written about this opposition during these past few months.] Any opposition between outer planets invites us to investigate the middle path. Swinging from one extreme to another, the real work seems to be in the space between. Are you finding yourself in the place of paradox, waiting for resolution, anxious about the tension between issues or choices in your life? How do you work with these forces? 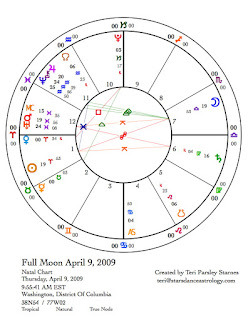 The Full Moon on March 10 aligns with the Uranus/Saturn opposition. We will have the opportunity to have these lessons illuminated. Venus retrograde. A retrograde cycle is a special journey that a planet takes. For Venus, this journey is much like the one the goddess Inanna took to visit her sister Ereshkigal. [You can read a previous article I wrote on the Venus/Inanna associations.] On March 6 Venus stations retrograde at 15° Aries. Every 19 months Venus turns retrograde. Venus’ retrograde cycle forms a distinct pattern in the sky. In 8 years Venus stations 5 times evenly spaced around the zodiac forming a pentacle. The points of the pentacle move very slowly through time. Currently the points are in Aries, Scorpio, Gemini, Aquarius, and Virgo. Venus entices us to discover how these important points on the pentacle can flourish through the expression of beauty, balance, and pleasure. Through this pentacle we may explore: How am I my authentic Self when I embrace Venus? How do I claim my Power when I embrace Venus? What do I learn as I embrace Venus? How am I freed by embracing Venus? What wholeness do I serve when I embrace Venus? One important feature of the Venus retrograde cycle is the length of time Venus will spend in just one sign. When Venus is moving direct, it speeds through an entire sign in less than a month. Due to the retrograde motion, Venus will be in Aries for 4 months (February 2 to June 6). [Venus will dip back into Pisces from April 11 to April 24.] In traditional astrology Venus is in her detriment in the sign of Aries. This means, that Venus is traveling through a sign opposite to one she rules, in this case Libra. Venus in Libra shows us her accommodating face, she desires harmony, relationship, and justice. In Aries, Venus struggles to align the need for partnering with the need for individuation. This Venus in Aries invites us to investigate how to bring balance into our relationships as we acknowledge that we are unique, that we sometimes must act in our own best interests, and that sometimes the journey is solitary. Aries is a fire sign. Venus reveals the beauty held within the flame and the consuming fires of passion. This journey to reclaim Self is a journey of courage. Inanna was Queen of Heaven, she was mistress of the green fields, keeper of the storehouse, custodian of the divine laws. She did not need to surrender everything for her underworld journey. But she did. What is the courageous journey you take on behalf of your Self? A way to honor Venus is to envelop ourselves in beauty. During this retrograde cycle, how will you honor Venus? March 11 Venus (14° Aries) sextile Jupiter (14° Aquarius) Energizing opportunity for beauty. March 27 Sun (7° Aries) conjunct Venus (7° Aries) This is the culmination of the retrograde cycle. March 28 Mercury (6° Aries) conjunct Venus (6° Aries) Thought and beauty combine. April 3 Venus (3°Aries) square Pluto (3° Capricorn) A confrontation with power. April 11 through April 24 Venus at 29° Pisces. A time apart to reflect and be inspired. April 17 Venus stations direct. Begin the return from the underworld. May 2 Venus (3° Aries) square Pluto (3° Capricorn) Another confrontation with power. Neptune and Chiron. The story of these two planets coming together in Aquarius is beginning to develop. In May Jupiter will join them in a near triple conjunction. This month, Mercury and Mars pay a visit to both. Anyone with natal planets or points from 21 to 25 degrees of any fixed sign (Aquarius, Taurus, Leo or Scorpio) will experience this transit more deeply. Both of these planets [Chiron is actually not a planet. Read an excellent article about Chiron by Richard Dagan here.] are initiators. Both challenge us to be more vulnerable, more open, more in touch with pain and grief. The shamanic initiation of Chiron can be experienced as a dismemberment or dismantling of identity where we are put back together with a part missing, a space left open to the other world. This opening gives us access to wisdom and healing. And it also feels like a wound. The Neptune initiation is much like Odin’s as he hung on the World Tree. Through surrender we attain wisdom and compassion. The transits from Mercury and Mars this month will begin to bring this story into focus. It is time to open and listen to Mystery. Remembering may help us put back the pieces of our lives. Developing compassion toward self and others may help us build a valuable foundation. Spring Equinox. In the midst of these transits and energies, the Sun moves into Aries on March 20. Day and night temporarily balance. 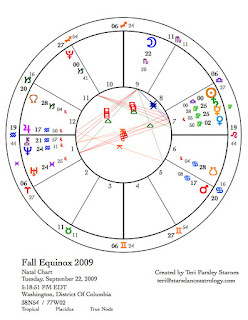 The chart for the Equinox shows the Moon in Capricorn, Saturn opposing Mercury and Uranus, and Pluto square the Sun. We enter this new season aware of the seriousness of the times. We must manage resources, hold ourselves accountable, and take on added work to create the world we envision. What feeds your resolve? How do you enter into the work invigorated and with joy? May we find the joy that sustains and may we share what gives us joy.